Given the number of posts I've published about them in recent weeks and months, you could be forgiven for assuming I'd already declared (or at least privately decided) this to be the "Year of the DS" or the "Year of the 3DS." In a way, of course, 2014 is and will be both of those things for me--unofficially, at least. Officially, though, it's already become clear to me that the focus of my thoughts and desires this year is going to be the handheld that started it all, the GameBoy. The fact is, I've been a smidge obsessed with the system--its extensive catalog of obscure Japanese games, in particular--since I wrote about Irem's Noobow early last year. Things only got worse after I discovered Peetan a few months later, and then Painter Momopie and Osawagase! Penguin Boy a couple of months after that. Sadly, I've yet to come across complete copies of Noobow or Peetan during my all-too-frequent eBay forays, but I have come across--and purchased--copies of Painter Momopie and Osawagase! 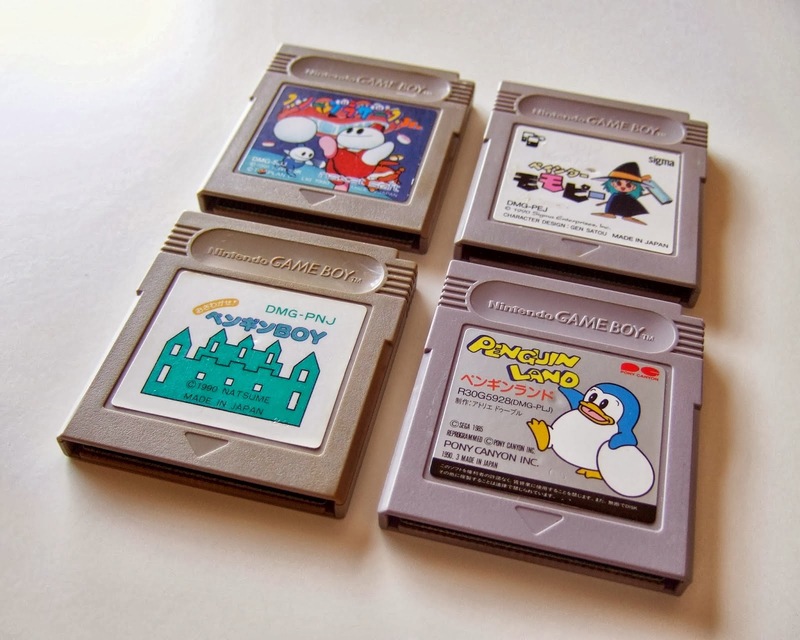 Penguin Boy and a number of other intriguing, import-only GameBoy titles in the last half-year or so. So, expect to see posts--featuring photos as well as impressions, if not actual reviews--about all of them sooner rather than later. At the moment, I'm not planning to "brand" these write-ups in any particular way, but who knows? Regardless, I hope you'll enjoy them. Yep, it's Snow Bros. And of course it loses a bit of its luster being in black and white, but it's still a nice game, if you ask me. I can't say I have any memory of having ever played a Pony Canyon game before this one, Jess, so I'm biased toward or against them. If you ask me, though, they didn't seem to screw up anything in this port of Penguin Land. BTW, I disagree that Penguin Land is a bad game. In fact, I rather like it! Also, it translates well to the small screen--or at least I think it does. Oh, and Penguin Boy is, in fact, the Japanese version of Amazing Penguin. I never played Amazing Penguin back in the day, so it's a new experience for me--and I really like it! Actually, the eBay shop I bought Momopie from had two complete copies when I bought mine, sharc. I'm pretty sure I nabbed it and a CIB copy of Penguin Land and one other game (Penguin-kun Wars VS.) mere minutes after they were put up for sale, so I have a feeling that you were gunning for the remaining one. Regardless, sorry :( I've been looking for a CIB copy of Momopie for ages now, so to see two pop up on the same eBay shop at pretty much the same time nearly made me faint. Actually, I'd been searching for a CIB copy of Penguin Land for some time, too, so it was quite a morning for me! BTW, I just did some digging and the second copy of Momopie I mentioned earlier is still available, if you're interested. And, really, for that price, how can you go wrong? Let me know if you end up buying it, will you? i've been after it for a while too, but hit japan's second copy is missing a reg card and got its price jacked up after the first one sold. i'm not really in the mood to haggle over it, though i may break on that - for whatever reason, it crops up on ebay far more than yahoo auctions. You want the reg card, eh? Man, I don't even care about that. I mean, I'll take it if it's included, but I don't look for it. I went with this one because it was in mint condition throughout--not that I completely care about that, either. And, yes, they definitely jacked up the price on the second copy after I bought the first. Maybe they didn't expect it to go so quickly? Or maybe someone screwed up the initial pricing. They also jacked up the price on the mint copy of Penguin-kun Wars VS I was eyeing up, so I ended up going with the one that had a slightly imperfect manual. Oh, well. Do you tend to look to Yahoo Auctions for this kind of thing, by the way? If so, which one--the US one or the Japanese one? I used Yahoo Auctions Japan to buy a CIB PC Engine some time ago, but that's the only time I've ever used it, mainly because it's a bit of a hassle to use a go-between, etc. i don't let lack of reg cards keep me up at night or anything, but the way it went from $20 with card and all to $28 without, plus missing out because of the seller's slow resonse, sours me on picking it up now. oh well. i do most of my gb import shopping on yahoo japan; the long waits and many misspellings to deal with on ebay for this sort of thing are just too much, and i really love the packaging on old gb stuff. Ah, well, I can't fault you for being a bit miffed, sharc. It is weird that the copy I bought cost just $20, yet they've since bumped up the price of the "lesser" copy to $8 more than that. Penguins in fanciful hats are pretty hard to resist! I'm not sure I should open the Pandora's Box that is Pony Canyon. It's a Japanese music publisher that made an unwise segue into the video game industry. Their games were developed by a handful of Japanese game designers... sometimes you'd get lucky and it'd be Guru Logic Champ designers Compile, but usually it'd be someone like Marionette (Dr. Chaos) or the kings of gaming horror, Micronics. That company designed Super Pitfall, which carries the dubious distinction of being worse than the 2600 games. Micronics created over a dozen NES games, either with Pony Canyon as a publisher or under contract with other game companies. None of them rise above mediocrity. Hmmm, I wonder which folks Pony Canyon got to make the GB Penguin Land port then? A quick trip to GameFAQs suggests it may be Atelier Double, but that doesn't help me much. Regardless, I stand by my claim that this version of the game--and the series in general--is at least mildly entertaining as well as acceptably unique.